Discussion in 'The War Room' started by Tropodan, Jul 25, 2016. I've been aware of China constructing their own carrier for a while but I still find it interesting how rapidly they're catching up. I know a lot of Americans have a sort of derp derp opinion on this thinking China will never catch up to the US. This is nonsense. Look at China's actions today in the south china sea. Just imagine the moves they'll make when they have 6 functioning carrier groups. "Moreover, China’s second locally designed and built aircraft carrier is under construction in secret in a shipyard near Shanghai. The Chinese Navy’s plan of deploying 6 aircraft carriers including 2 nuclear-powered ones by 2025 is not an empty boast." A metal floating building in the sea? Lots of dead Chinese soldiers from Asbestos poisoning. Not racist, am asian, it's cool, i know how my pplz operate. mike sherry, 7437 and Banchan like this. Nice ski jump - looks like they're preparing for the next winter Olympics too. Oh - and they're going to build 6 within the next 9 years? Riiiiiight. mike sherry, 7437 and Wadtucket like this. Get back to me when they have working catapults. Yes they can produce some nice war ships but the only way they catch up is if we stop and wait for them. By the way we are working on Electromagnetic catapults (they are testing them now) and have you seen the newest ship designs (stealth) being launched (still have to work out some bugs). Videer and 7437 like this. What makes you think they would make any moves outside of their own backyard? I mean everyone makes moves in the South China sea, China is just the biggest players. IMO China has no desire to make any move worldwide other than stabilize things. The more stable the World the better it is for China. And they simple dont care like the US does when it comes to world wide military presence. Even with a bigger Fleet they will use it much more local. China will move to control the resources of Africa. Remember how many U-boats the Germans built in a short time period? They dont need a fleet to do that. You just have to pay them the money for the mining rights, which China is doing already. You cant just rock up in Africa and try to control them with military force, those days are long gone. You have to invest heavily and make questionable deals. Also all your investments in Africa are only worth something until the next coup. Just because they own an aircraft carrier doesn't mean they'll know how to use it properly. The USN has significant experience advantage over everyone else in that regard. As resources dwindle through the 21st century more competition will arise for the resources of Africa. If people get desperate enough the military will become a factor. Just like it has, every single time in human history. Yes, but china will close the gap. They have a sense of urgency the west lacks today. How will they make up for decades of active combat experience? A sense of urgency. Don't act like it's impossible you have nothing to stand on with that attitude. 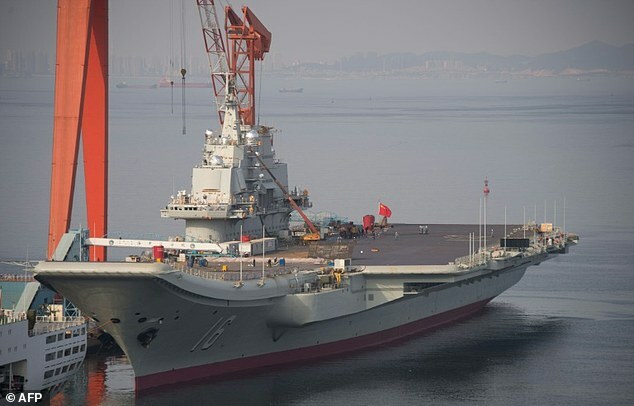 I don't see China matching US carrier tech any time soon but operating blue water fleets sometime in the next few decades would give them a lot of power. Just because the US could technically beat them doesn't mean they would. All China has to do is make the fight nasty enough and America will stand by and watch China's passive aggressive game succeed. America simply doesn't have the collective resolve anymore to stand up against China. But if you assume there is a dispute for the resources of Africa, wouldn't the west be much stronger than the Chinese? Even if China catches up with the US on financial spending, if it would be a desperate situation countries like Germany, France, Italy would drastically expand their military spending. And would have a lot more technical expertise than China. They would never be able to match Western economic power, the communist regime would also crumble before this conflict begins, because people in China only support the system as long as it offers them a better live. They voices for freedom like we have in the west will become louder and louder. It just a lot of fear mongering IMO, having a large fleet like the US is not easy to maintain or engineer in the first place. You can't fabricate active combat experience. It's not about tech, it's about experience. Unless their sense of urgency draws them into a war with other naval powers in which they begin running 24/7 sorties around the clock for over a decade. Experience is almost always the deciding factor in larger conflicts. As boisterous as China has been, they have no practical modern combat experience in any theater, land, air, or sea. The truth is our Navy pilots are incredibly skilled and are capable of incredibly feats of endurance that the Chinese just aren't aware are even possible because of their lack of practical experience in combat situations. Apparently this isn't true. I've been debunked a few times by some of the posters here when I used that line of thinking before. I wish I remembered the poster but I think they were from China. Basically the Chinese have a deep rooted sense of nationalism and are willing to take a hit in the pocket for the greater good of their nation far more than western people. What's good for China is good for them. It's about training as well. Training just as much as combat experience. Training training training. Training only gets you so far. IMO the line What's good for China is good for me" is based on their economic rise over the last few decades. Because for most people what was good for China was actually good for them. Now when China loses its jobs to less developed countries all of a sudden they will feel the economic impact and that opinion will change. The other thing is that the communist party profits from the Chinese population being largely uneducated in the past. But now with the rising middle class you will have normal working people being able to sent their children to university and with the internet people are more educated and informed. They wont put up with the communist system for much longer, why would they. They see someone in the west having more rights and a better financial life and want to have the same. And the Chinese regime knows that too that why the desperately try to block the internet. If I would have to guess I would say we dont have a China like we have it today in 30 years. The Chicoms are capable of manufacturing both high and low quality steel. Their problem is they're not aware of when they are doing it.